In quickly glancing over some of the meaning-hunting and plot-unpacking write-ups prior to sitting down to type out my own thoughts on the complicated Cloud Atlas, it seems the general consensus is that the film offers a map of human experience. It is built on a butterfly effect of relationships; of souls across time, not bound concretely by a punctuated sentence like reincarnation, but pivoting off of the myriad of ways human beings weave in and out of one another's lives. Cloud Atlas is a chronicle of human accomplishments and foibles, it is about the strength of bonds of love and friendship, the beautiful things we can create, the devastating power we have to destroy our own, and the lasting way that evil is ever-present in our natures. Across time, across worlds, the song of man remains the same: we do not change, we do not always learn, but we persevere and in darkness find light. Yes. The arguments supporting this reading are sound, and certainly written in to the mercurial structure. While I'll posit a secondary consideration here, I'll agree: Cloud Atlas is a song reliant on six voices, a sampler of the best and worst things we are capable of. As such, it's a remarkably ambitious undertaking in any medium. In adapting the novel for the screen, the Wachowskis and Tom Tykwer have largely succeeded at making a beautiful, thought-provoking, wholly unique cinematic experience. 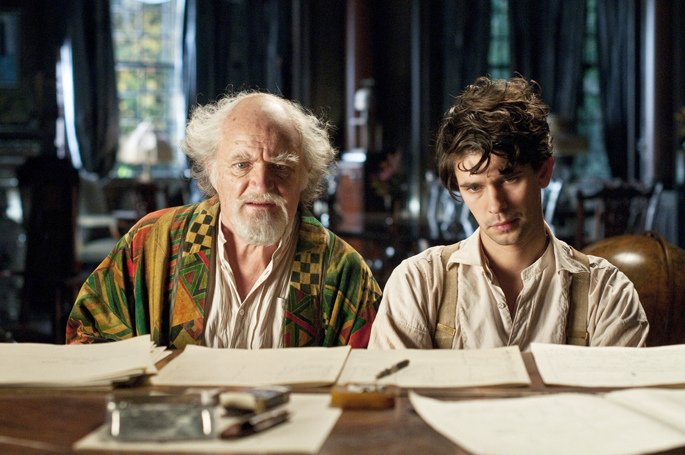 While Cloud Atlas is at times self-important and certainly has its flaws, it's a daring project which manages - above all things- to be graceful. We open on an island in the distant future, "106 winters after 'The Fall'," according to the film's lore. Here we are introduced to Zachry (Tom Hanks) who belongs to a tribe of people who speak in a cultural mash-up of stylistically broken English (a bit of UK street accents, Jamaican, creole, southern drawls, and Jar Jar Binks). Zachry is plagued by visions of a demon (a Baron Samedi leprechaun, basically, played by Hugo Weaving) who urges him towards a loss of humanity even after he decides to help a technologically advanced stranger (Halle Berry) on an important quest. Before we know any of this, really, we're warped back into a 19th century sailing drama built of mysterious ailments, slave trades, and searing sun. Here we follow a young lawyer (Jim Sturgess) attempting to take care of the particulars of a complicated business arrangement. It's all terribly Melville. From there we jump out of Melville and towards Waugh and Isherwood: our 1930's UK-based story follows a dandy Robert Frobisher (Ben Whishaw) as he pens lilting love letters to his secret boyfriend Sixsmith (James D'Arcy) and composes the "Cloud Atlas Sextet" as amanuensis to an established, slippery old master (Jim Broadbent). So follows a direct connection in which a much older Sixsmith participates in a 1970's conspiracy narrative involving a nuclear plant. He recruits Luisa Rey (Halle Berry), a hard-nosed journalist who picks up Sixsmith's cause when he meets an untimely end. They're after the truth, dammit, and the genre stylings mirror every espionage thriller of the day. Chronologically, after the 70's we move to a present day sideways commentary on the literary world, in which we're given a delightfully wacky sort of British prison-escape comedy in which an editor (Broadbent) becomes unwilling prisoner at the hands of his own brother. The themes here lead us indirectly towards the final, heavily science-fiction influenced section set in 'Neo' Seoul. I won't reveal too much on what's happening here, but, uh, if you like the dystopian sci-fi flicks of the 60's and 70's...you'll probably love this. All of these stories are different. They are visually singular and while connected by threads and shadows cast from time period to time period, can be appreciated when divorced from the overarching grandeur of the full arrangement. Each is narratively sound as its own miniature movie, and while the actors overlap repeatedly, it's easy to see why they were all cast. Everyone does a rather fabulous job in Cloud Atlas, and if you (like me) were surprised by the rather 'generic' casting of this heavily cerebral film, the value of these familiar faces is immediately apparent in the viewing. The benefit of a Tom Hanks, a Halle Berry, and even a Hugh Grant is that no matter how much odd makeup you pile on them (and there is some very very odd makeup in this film, which is at times problematic), they are somehow immediately recognizable. You understand, implicitly, how the souls of their characters have traveled or developed. You know, without question, who is who (thought the "Asian" makeup in Neo Seoul is perhaps the most distracting). As you watch Cloud Atlas part of the experience is stumbling upon the small connections: the Easter eggs snuck into other chapters. The bloodlines, name drops, and lasting impressions of past ages. Humans leave traces, there are strange echoes heard across time. It's phenomenally easy to understand, and yet difficult to articulate. It seems to be suggesting very basic things: this is good, this is bad, this stuff carries over. But, if that's all it's doing, it seems almost not worth it. Yes, Cloud Atlas is making definitive statements about human nature, but it's not stopping there. While the story may be laced with moral implications, there's something often clinical about its perspective. It's exacting, devoted to its structure, and using the act of a new creation to do that which all of its stories' protagonists are also attempting: it is investigating. It is finding higher truths in smaller fictions. I'd read a chunk of David Mitchell's sprawling novel in the not-too-distant past, and while I sadly never got around to finishing it (I will), what I gathered from its shifting points of view, styles of narration, and bold experimentation with genre was that it was just as much (if not more) interested in the formal elements of telling a story as it was with the basic, emotional draw we have to a story. While Cloud Atlas uses the musical sextet as a point of reference, I'd argue it's also a poetic sestet: a stanza arrangement seeking to give us information with rhyming corollaries. End rhyme, slant rhyme, beats where we find stretches of alliteration, corresponding images. The characters all seek the truth, and via analysis, so do we. The contrasting styles Mitchell used are, perhaps, a virtuoso act of utilizing genre to peel back the layers on not only the act of being human, but the act of telling stories. Cloud Atlas gives us memory, it gives us art, it gives us soul, and it shows us all the different ways we can tell the exact same story; all of the ways we will continue to tell the exact same story because the elements are set and while the conditions may shift, we cannot change. Perhaps it's the literary theorist in me coming out, but what's most interesting about what these directors have done with Cloud Atlas may be the largely successful execution of the form. While we can analyze the individual elements and seek out meaning, the 'truth' sought is subjective. 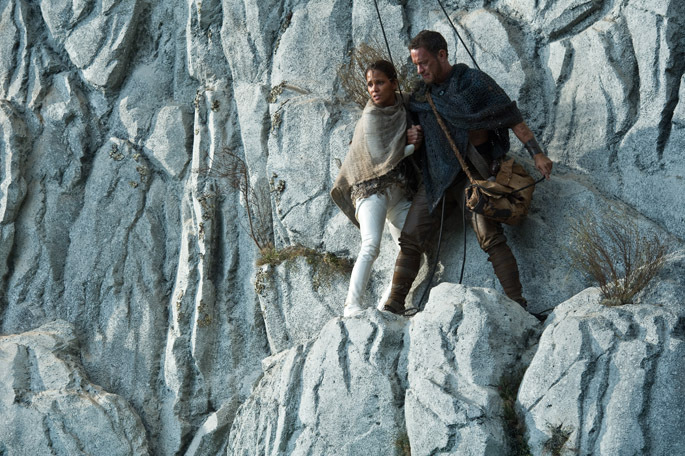 Cloud Atlas presents us with a way of reading. Ultimately, what you take from it is your truth.